One of the things I have grown to love so much about the jam scene is just how much you can find within it. I used to be one of those people that assumed that "Jam Band" meant Grateful Dead ripoff band or tired cover band trying to do again and again what has already been done. I had no idea how many levels there were to the scene. I had no idea how many scenes existed within the scene and despite that, how inclusive it was to anyone who wanted to come inside and be a part of it. I am constantly finding something to to be excited about, and even better, to be completely taken aback by. Enter The Heavy Pets. I was really excited when I first heard that The Heavy Pets had a new record. I won't lie and say I am any kind of long-term fan of the band because truth be told, I am still wetting my feet in their pool of awesome that has been steadily filling for about the last decade. However, over the last year more and more of their songs have been dropping into my mixes and I am not at all complaining. It's been great and the more I hear, the more I like. I have really grown to appreciate what this Florida five piece can do both as a whole and as individual artists. There is a whole lot going on in their music and I love that every time I listen through to their stuff, I seem to hear something that I somehow missed last time I heard it. To me, that is stellar songwriting. 2018's Strawberry Mansion is no exception. It is impossible to pin down with a label exactly where on the full music spectrum that it falls. It's an amazing experience to go through this record from start to finish because there are points while doing this that I honestly forgot it was the same album I started. It's not news to anyone familiar with The Heavy Pets that they are extremely versatile both as musicians and song writers, but it's this writer's opinion that Strawberry Mansion takes that to a whole new level. Each track takes you to another moment, another feeling, another style of writing. They are amazing lyrically as much as musically and the combo creates some amazingly wonderful sensory experiences. The album starts with the track Higher which I am very honestly currently obsessed with. The song has an infectious reggae groove that is layered beneath these incredible lush but sleek vocals, but it's that dance-tasty thing that happens at the chorus that really got to me. It's very hard to listen to this and not start moving and feeling it rush through you. There is something in this song that just gives me goosebumps as it moves and changes. That groove is addicting in the best way possible with it's steady and cool bass line that is wonderfully prominent. This song gets put on repeat in my car a lot. The very next track though, Shahryar's Rage, takes things in a completely different direction with funk-heavy, steady groove and a completely different but still fantastic vocal style. I love that The Heavy Pets shake up their vocals the way they do. They never seem to fall into a rut with their songwriting and there is something incredibly refreshing about that. Skip on over to the song Carry The Man and you are treated to that reggae feel again, though slower in style while remaining heavy on steady groove. Stop and feel it creep up your spine and move your hips. I love that! Rainy Days is another great track that has a funk-rock feel with great guitar solo work and smooth vocal harmonies. It's got a really cool style that gets into you and makes you want to sing along. The keys in this song are tasty and form fitting while adding even more flavor as the song progresses and changes. Every piece is put together perfectly creating a colorful and rich treat for your ears. Don't get stuck in this groove though because the album is about to pick it up and spin it around. The very next song, Invisible Coyotes, throws you into another space entirely with straight heavy hitting rock and I LOVE everything about it. The guitar, the beat, the vocals, everything is layered perfectly. The guitar solo in this is fantastic. The drummer is so on point with everything he put into this song. The best part? This song sounds nothing like any other song on the record. I have honestly never come across a band that could pull this off and I am both profoundly impressed and delightfully surprised by the album as a whole. 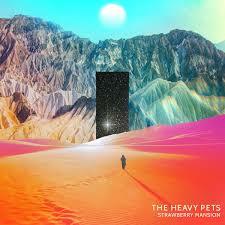 The Heavy Pets have proven yet again that they are masters of versatility and can't be pinned down into a genre. I think that is really what is so great about the jam scene though and one of the reasons the band has such an established home in it. There are so many layers to be explored within the scene, enabling a band as talented as these gents to really expand on everything they are and go nuts. That is Strawberry Mansion in a note. It's exploratory and multifaceted. It's multidimensional and never boring. You won't find yourself standing in the same place twice while listening to this record, and I think there is something amazingly refreshing about that. I have not yet had the pleasure of seeing the guys live, but it's on my list for 2018 and it should be on yours too...right after you pick up your copy of Strawberry Mansion. The Heavy Pets are out and about playing shows and you can get a list of what they have going on at their website HERE. I hope to see you out there! Lets get a beer.